Has Karen Armstrong ever read Feurbach? In the past, theologians have found it useful to have an exchange of views with atheists. The ideas of the Swiss theologian Karl Barth (1886 - 1968) were enhanced by the writings of Feuerbach ... But it is difficult to see how theologians could dialogue fruitfully with Dawkins, Harris, and Hitchens, because their theology is so rudimentary. The atheism that fears the light is an unworthy and hollow atheism. Such atheists have nothing to say, and that is why they are afraid to speak out. The cryptoatheist says only in private that there is no God; his atheism is summed up in this one negative statement, which stands all alone, so that his atheism changes nothing. And it is perfectly true that if atheism were a mere negation, a denial without content, it would be unfit for the people, that is, for man or for public life; but only because such atheism is worthless. True atheism, the atheism that does not shun the light, is also an affirmation; it negates the being abstracted from man, who is and bears the name of God, but only in order to replace him by man’s true being. Let us then leave the dead in peace and concern ourselves with the living. If we no longer believe in a better life but decide to achieve one, not each man by himself but with our united powers, we will create a better life, we will at least do away with the most glaring, outrageous, heartbreaking injustices and evils from which man has hitherto suffered. But in order to make such a decision and carry it through, we must replace the love of God by the love of man as the only true religion, the belief in God by the belief in man and his powers – by the belief that the fate of mankind depends not on a being outside it and above it, but on mankind itself, that man’s only Devil is man, the barbarous, superstitious, self-seeking, evil man, but that man’s only God is also man himself. 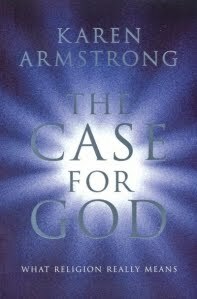 But to return to Karen Armstrong: the real irony of her recommendation of Feuerbach is that Feuerbach's argument (meticulously reasoned and documented, as Barth admits through his teeth) that 'God' is nothing other than human consciousness unaware that it is describing itself is above all applicable to the mysterious, ineffable, indescribable, elusive, ungraspable 'God' for which Karen Armstrong makes her case. Fantastic post. I hadn't read Feuerbach either but I will dig it out. Love this line - "True atheism, the atheism that does not shun the light, is also an affirmation; it negates the being abstracted from man, who is and bears the name of God, but only in order to replace him by man’s true being." Thanks Ken. Thanks James - Feuerbach is well worth reading. Get the hard copy if you can - the online version I linked to doesn't have the footnotes, which are useful even though George Elliot left the Latin citations untranslated. Them were the days. Feuerbach opened the door for Marx and Engel's collaboration with the League of Just. The League of the Just originally argued for socialism in Christian terms. However shortly before Marx arrived in Paris, the League had done a Feuerbach study. Apparently, they actually read popularized presentations by Ludwig's brother. The London branch even renamed its Worker's Association reading room, the 'scientific' reading room. Without the influence of Feuerbach the League of the Just would never have ended up as the League of Communists. I owned the book but lost it when I moved to the Netherlands in 1972. I read part of it and approved, although at that time I had no patience for all the Biblical detail. The notion of a God image as some sort of ideal projection of the human appealed to me and still does. I remember almost nothing of what I read, so I'll put it on my list of books to be re-read. The author of "Middlemarch" did us a fine service by translating Feuerbach's book. Quite off-topic Ken, I liked your remark about the good old days when writers could leave Latin texts untranslated. I shall add that the American edition of Feuerbach was part of the Harper Torchbook series, which had scholarly books in low-priced paperback format. The series is defunct, to the disadvantage of a generation of students who don't know how intellectually exciting the 60s and early 70s were and now malign them. Cheap books were our bread and butter. George - the Haper Totchbook pb is the one I read. I found it in a second-hand bookshop. And I agree about the cheap books in the 60s and 70s. I got most of my real education from them. Just curious: What's the source of the quote at the end of your post (We see nothing of the mind's working...)? I like that. 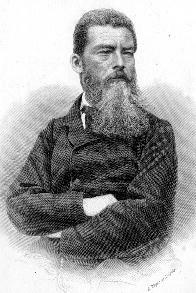 Ludwig Feuerbach influenced lots of other people besides Marx & Engels. Friedrich Nietzsche, Sigmund Freud, and any number of 20th century theologians from Barth to Tillich, were among Feuerbach's admirers. Marx Wartofsky wrote what is the most sustained study of Feuerbach's work. I enjoyed Ken's story about the Anglican chaplain. God love those Anglicans! Reminds me of the episode in "Yes, Prime Minister," where Hacker has to appoint a new bishop, and finds out to his consternation that most of the likely candidates are atheists. mtconleyuk: the source is a poem I wrote many years ago. Glad you like it. mysterious, ineffable, indescribable, elusive, ungraspable ... a contemporary of Feuerbach went even further, and noted that "Man", too, was not a creature actually capable of holding an idea, but was itself an idea. The holder of ideas was and is the individual person, so first and foremost, the characteristics believed of God, that Feuerbach felt he pulled to its source by making them characteristics of "Man", are but self-idealizations of individual little men. Self-idealizations by which they afterwards feel compelled to judge themselves. But the judge, again, is the same individual man. So who came upon this progressive realization? None other than Max Stirner, the target of 500 pages of vitriol from Marx in "The German Ideology", vitriol that really never make it further than to Marx' own lips. Solan - what I meant was that the 'mysterious, ineffable, indescribable, elusive, ungraspable' experience that Karen Armstrong identifies with experience of the divine is rather suspiciously similar to the experience of trying to grasp 'the self that knows the self we know', and in some mystical traditions is very directly identified with it: 'Thou art That'. This may be a different point from the one Feurbach is making. As for Marx's '500 pages of vitriol' I've not read them, but I intend to. From expositions I understand Marx was attempting to do much the same to the Ego, the Subject, as 'St Max' had done to Man. But isn't the idea of "God" being Man's mistaken conception of himself also an article of faith (i.e. unproveable)? I don't see Man's "powers" extending far beyond his ability to delay (and therefore compond) calamity. All I see here is faith being replaced with another form of faith, just as Marxism or Neoliberalism or Transhumanism are just other forms of eschatology. I think Jung was right when he posited that the way Man thinks is fundamentally religious, and Spengler even more right when he observed that all Western thought is ultimately a romance with infinity.